Close by to your luxury Rotorua motel accommodation at Tuscany Villas, bubbling mud and steaming vents are commonplace in Rotorua – the geothermal capital of New Zealand. 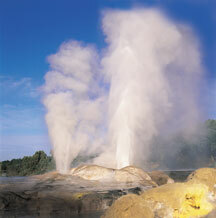 Explore one of the many thermal parks, many which are coupled with a Maori cultural experience. Known as the world’s youngest geothermal system, Waimangu Volcanic Valley was created when Mount Tarawera erupted in 1886, creating the 7 craters that make up the valley and exploding Lake Rotomahana to 20 times its initial size. The crater lakes, each a distinct colour create stunning photo opportunities, along with an abundance of pristine native bush to explore. Pack your walking shoes and your camera and visit during your next Rotorua holiday! Wai-o-tapu, meaning sacred waters in Maori offers the ultimate Rotorua experience in geothermal wonders. Begin your journey with a visit to the Lady Knox Geyser which erupts daily at 10.15am. The geyser reaches 10 to 20 metres into the sky! In our thermal area, follow the well marked tracks around this naturally colourful area. Experience the brightness of the world famous Champagne Pool, the many different shades of green of the hot and cold pools and the steaming ground. Don’t forget to visit the Mud Pool before you leave and marvel at the bubbling and popping of the erupting mud. 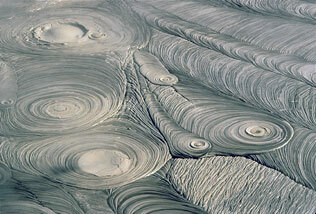 Te Puia is home to the New Zealand Maori Art and Crafts Institute and also the Pohutu geyser. Learn traditional Maori weaving and carving; explore the thermal valley with mud pools and boiling waters, visit the Marae, the kiwi house, or Te Po – our evening cultural experience, including a meal, entertainment and cultural storytelling. Experience Maori culture and history live at Tamaki Maori Village. Sit back and relax as you enjoy the tales of first chapter in the Chronicles of Uitara, the Journey of Ages. Here you’ll experience ancient ceremonies, welcomes and farewells, song dance and more! The Buried Village offers an insight into the lives of the people of the Te Waiora Village, which was buried by lava and ash when Mount Tarawera unexpectedly and violently erupted in 1886. Over 150 people were killed during the disaster which destroyed the pink and white terraces. The Buried Village offers a loop track which allows you to explore the excavated area which was once the Te Waiora Village. See the buried cottages, the Rotomahana Hotel which collapsed under the weight of mud, the whare (Maori meeting house) and the museum with hundreds of stories and artifacts.